CaféDirect have had a bit of a rebrand recently; the packaging certainly looks crisper and more modern, and they’ve dropped the rather curious “made the small way” slogan that bemused me so much when I reviewed their Colombia coffee a few years ago. Then again, they’ve replaced it with “Ridiculously Good Coffee” which is, while less confusing, not really much better or more meaningful. Of course they’ll tell us it’s good coffee, because what company is going to put “pretty ok coffee” on their product? Regardless of the marketing, they remain a coffee producer committed to fair trade – not only being FairTrade certified, but also pouring 50% of their profits into their charity foundation which works directly with farmers to improve sustainability and livelihoods, right across the coffee growing world. 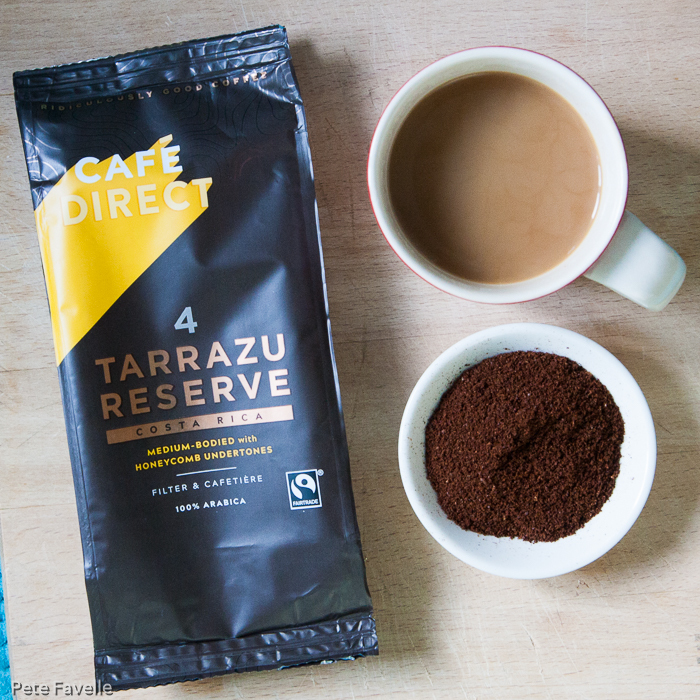 Tarrazu Reserve is a coffee from the volcanic Talamanca Sierra, above the Tarrazu valley in Costa Rica. The grounds have a sweet aroma; toffee wrapped in milk chocolate, with just a little dark fruit lurking below. Brewed, the sweetness drops and it becomes more of a dark chocolate blended with a nice, slightly woody tannic aroma. In the mouth, it has a gentle sweetness balanced nicely by a tannic dryness that lingers well. The body is decent, but there’s less depth of flavour than I would like. Still, the balance makes it a refreshing daytime coffee, especially if you prefer your coffee on the gentler side. 3.5 stars for me. Many thanks to CaféDirect for providing PeteDrinks with this coffee for review.